- More chat services, suggestions most welcome. ▸ Implement touch ID Password unlock for macs with touch bar. ▸ Fixed Skype and WhatsApp freezing issue. ▸ Fixed Slack notification issue. ▸ Fixed all the bugs reported on support tickets. ▸ QQ & WeChat does not work for new accounts as they does not allow to use. ▸ Downloading the audio file in WhatsApp is fixed. ▸ WhatsApp video recording handled. ▸ HipChat automatic opening of Members List after new message arrival issue rectified. ▸ Slack login using single sign-on (SSO) is handled. ▸ Spelling check for all messaging services is enabled. ▸ Skype drag and drop image option fixed. ▸ No Internet connection' pop-up showing even for weak signals rectified. ▸ Option to remember the password. 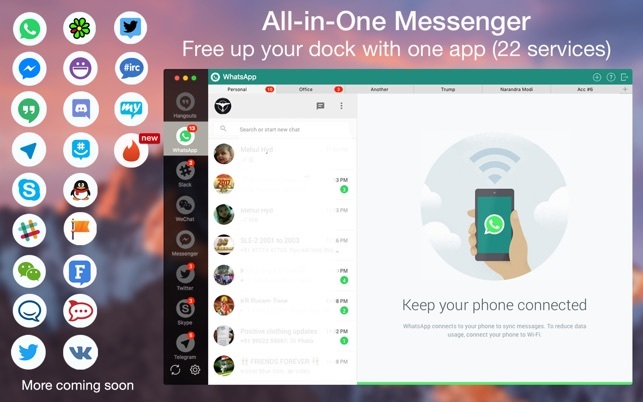 ▸ New services added are IRC chat, MySMS, Tweetdeck. ▸ Option to stop GIF prompt while typing the message. ▸ Option to mark all messages as reading. ▸ Now you can send GIF instead of just a text message. ▸ Schedule message to send them later. ▸ Fixed Skype calling plugin. ▸ Rearrange messaging services on the menu. ▸ Added indicator for file download. ▸ Fixed network connection status. ▸ Take video and selfie from WhatsApp. 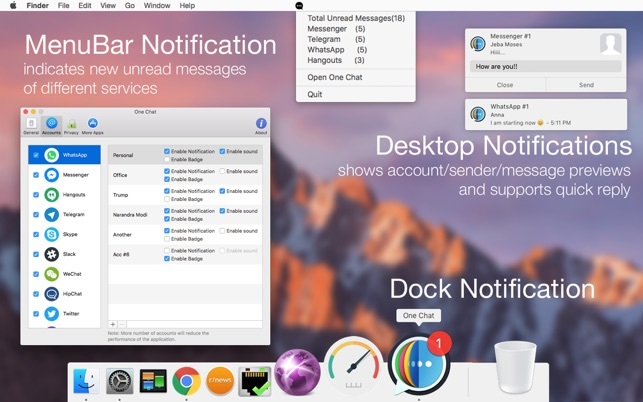 ▸ Notification Badges for individual chats services. 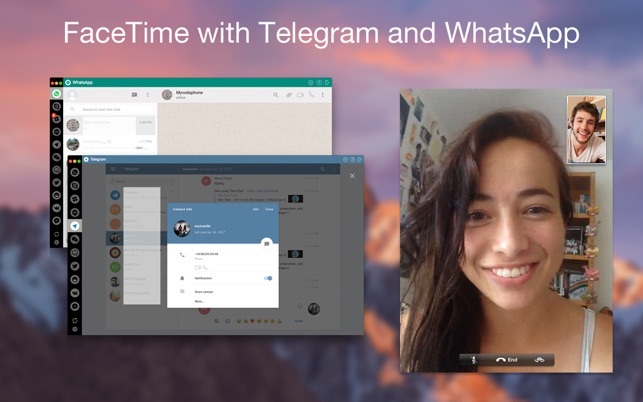 ▸ Fixed Hangouts and Skype calling. ▸ Fixed upload of media, docs and other files from the folder. ▸ Add/Remove services from the left menu, as per the requirement. ▸ Customize Notifications as per different accounts. ▸ Fixed Media(Picture, Video or music) upload and download issue. ▸ Fixed URL click issue on Facebook messenger. 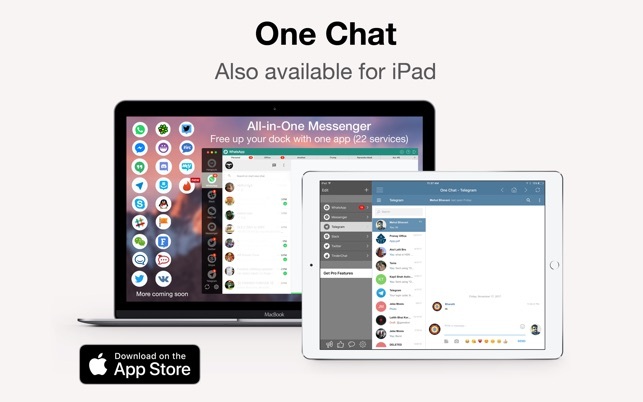 ▸ If you enjoy using "One Chat" App, Please review and rate. That keeps us motivated. Note: Some new and existing features might not work in below MacOS Sierra. But lower OS version users can use it with limited functionality. 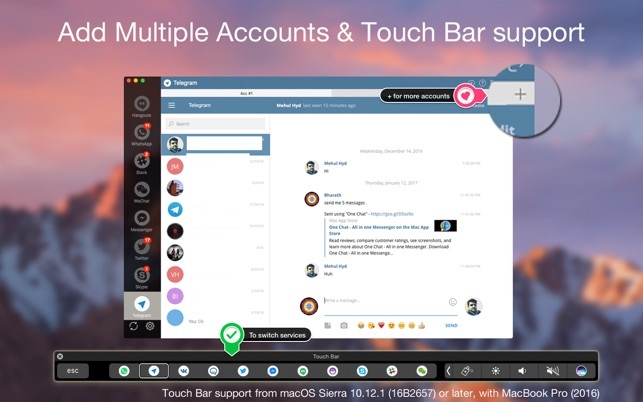 WhatsApp, FB Messenger, Hangouts, Telegram, Skype, Slack, WeChat, HipChat, Twitter, Yahoo Chat, ICQ, Discord, GroupMe, QQ, Messenger for Facebook Pages, Fleep, VK, RocketChat, Tinder. ▸ And many more surprises. Special Thanks to our all existing user with following users who are helping us with suggestions and support. We respect all the suggestions and requests from our users and implement, which we feel are most important and solves the real problems of all users. Overall, using One Chat does provide a couple of advantages when it comes to security. It does not store any messages or logins. Got sick of running a half dozen browser tabs for messaging apps. This collects everything in one simple interface. The only issue I have is that discord notifications do not work well when you have more than one server connected (they all work fine inside of discord’s own sub-tab but the message counts etc do not percolate out to be visible when using another service), but i know this is common across many different messaging aggregators including franz and is likely discord itself that is causing the issue there. And yes technically this is just an aggregator of the various web front ends etc, but its worth it if you are drowning in messengers/chat apps, it keeps everything simple, consistent, and contained and that is absolutely worth the cost of entry for me. Great app but the support just is not there. So to be honest, I love this app! it makes keeping on top of all the messaging super easy! The problem I have is that everytime I try to log into Discord, I get an error “Well, this is embarrasing… having trouble logging in” or something like that. I reached out to the developers about a month ago and still no response!! Thats just unacceptable for a paid app nowadays and that’s why you get 2 stars! At least tell me that you are working on it. Especially when I mention that this is the main app I needed here besides Telegram. Please fix this issue and i will gladly change my review to 5 stars. Thanks! I swear that when I first got this app, I gave it a good review, but it seems like release after release, it gets worse and worse. In the newest version, the same horrifying issue that is in the Skype module, is now if the FB Messenger moducle. Click a link to a website, and it doesn’t open. In Skype, it tries to help you find an app that will open the link (browsers aren’t one of the apps allowed). In FB Messenger, it now downloads an HTML file. In addition, can’t make FB calls, can’t make Skype calls, and it crashes more often. This used to be VITAL to my everyday work, now I am ready to throw it away. Thanks for reporting the issue and our apologise for the inconvenience you are facing. Please write us support@appyogi.com, we will surly investigate the issue and resolve it as soon as possible.